NEWS: We received a The Pittsburgh Foundation Advancing Black Arts grant to fund Liana's Pilgrimage to Brazil in November 2018 and more community programming! Stay tuned for more information on the gallery show that will go up in 2019! Thank you all for the continued support. We always need support! From feeding youth groups to supplies for community events, we need your support! Foundations only go so far and this work is not a priorty for them. We need your support today. We want to see equity in service learning programs and encourage organizations like the Rotary, Colleges and Universities, CISV, and more to think about equity in travel opportunities. For some adoptees and multiracial people, being able to tell their stories can save their lives. Suicide rates for adoptees are almost double the national average. Brazilian born, Pittsburgh raised Liana Maneese is an award winning activist, artist, visionary entrepreneur, and catalyst for new and creative ways to engage. She is an Afro-Brazilian transracial adoptee on a mission to excite folks around the power of personal responsibility, knowledge of self, and how that power can be harnessed to change the world. Adopting Identity: The Exploration of Lies, Luck, and Legitamacy, raises questions around interracial relationships and building emotional resiliancy. Through individually challenging ourselves to confront the hard truths of race, privilege, and admission, Liana seeks solutions that other families can use to become stronger. She is the founder and co-owner of The Good Peoples Group that specializes in creative and cultural problem-solving through identity navigation, constructing and honoring resilience, strategic organizational development and dynamic team building. Always pushing her own boundaries of self discovery, her story motivates and inspires many through speaking, creative projects and her commitment to understanding people, processes, and equity in relationships and business. Liana offers lectures, community programs, and other events that center around her experience, as well as those like hers. Please contact or donate if you would like to see more programming around building healthy interracial families and building emotional resiliancy. Please Google the following for news, articles and much more! Timing is everything. By 2044 this country's identity will be drastically different! “Our country has historically embraced its identity as the world’s melting pot. Today it is on the cusp of becoming a country with no racial majority, and new minorities are poised to exert a profound impact on U.S. society, economy, and politics” -William H, Frey, Author of Diversity Explosion. 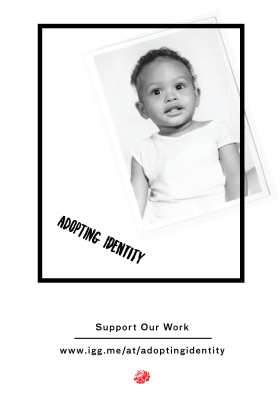 A social practice art project run by artist, activist, entrepreneur, Liana Maneese, and a team of other adoptees as well as those living with complex intersecting identities. This is a "for us by us" approach centered on amplifying solutions based in experiences not simply couched in opinion.